Which will be your choice from MWC 2018? It’s the battle of the flagships - the two top phones from MWC 2018 are doing battle, and it’s something of a humdinger. Where Samsung raced ahead last year in terms of design and spec, Sony has played catchup this year - and largely achieved it. Sony is offering a more powerful, innovative and refined handset, but Samsung has still offered a raft of improvements to the Galaxy S9 that people will still find exciting. But if you’re on the fence, this is where you should start in making a critical choice in your life. Sony has updated the design of the Xperia XZ2, bringing a fresh new take on what you can expect from a handset coming out of the Japanese brand. Where once you were given a bezel-heavy, blocky device, now you've got a glass-clad shimmering device in your hand. The front and back of the phone are covered in 3D-rolled Gorilla Glass 5, which encases the new, longer display. This means while there are still bezels, they're minimized from before. While the back does curve a little, it fits nicely into the hand, and it's mostly reachable with a single digit. The Samsung Galaxy S9 is, basically, the same phone as the Galaxy S8 in terms of design. The front and back is also clad in glass that rolls into the side of the device, but it doesn't quite have the same shimmer. It's flatter too, but that doesn't mean it feels poor in the hand - quite the opposite. Both phones are IP68 rated, so can handle a large amount of dunking in water and being rolled in the sand - but the Sony Xperia XZ2 doesn't have a headphone jack like the Galaxy S9 does. The cost of the Sony Xperia XZ2 is a little lower than the Samsung - although not by a huge amount. You're still going to be spending a lot of money on either phone, but the Galaxy S9 costs £739/ $719.99 (about AU$1310), where the Sony Xperia XZ2 comes in at £699 / (around $975 / AU$1250). Both of these are pretty pricey models, so it’s going to be up to you whether the S9 is worth the extra cash. The screen wars between these two brands is pretty cool (if you’re into that sort of thing). Both have exceptional screen departments, with Samsung banging the OLED drum and Sony thrusting the best of its Bravia brand into the LCD screens it’s putting out on the Xperia phones. The Samsung Galaxy S9 has a 5.8-inch display, where Sony has a 5.7-inch option, but both offer the longer 18:9 aspect ratio. However, where Samsung nudges ahead aesthetically is in the lack of bezels - Sony’s got a couple of chunkier bars above and below the display, where Samsung has thin strips and more of a curved display at the display. There’s also the resolution: Samsung’s got a QHD+ display on offer, where Sony only has a Full HD offering. Yes, the Galaxy S9 has a super sharp screen in comparison, but out of the box Samsung sets the screen to Full HD in order to save battery… so for those that don’t know that, they’ll think a lower-res screen is the norm. 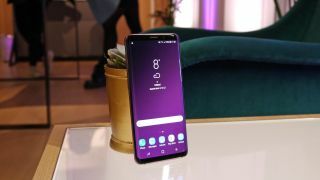 Both the Samsung Galaxy S9 and the Sony Xperia XZ2 come with Android 8 Oreo out of the box, so you'll have the latest features from Google on your phone. And in terms of power, both phones are running the Qualcomm Snapdragon 845 chipset with 4GB of RAM (in the US), but elsewhere Samsung has imbued its phones with its own Exynos 9810 CPU - and historically the Exynos have been a touch quicker, although we still need to test that. But in short, both phones will be largely as quick as one another, no matter what happens. In terms of new features, the Samsung's AR Emojis build an animated version of you, where Sony's handset can scan your head and create a 3D model that will scare the very life out of your friends / make a lovely gift as a bauble at Christmas. The camera technology on both of these phones is similar in some ways (in that they're both very powerful) but differing in the key features they offer. Firstly Sony only has a single sensor, but is offering the world's first 4K HDR video recording. Samsung's got a 12MP sensor, where Sony's got a 19MP option with MotionEye recording for improved action sensitivity. But Samsung's big play this year is with its dual-aperture technology, where the camera will alter depending on the conditions - if it's dark, the aperture opens, and when lighter it'll shrink to get the best picture each time. Sony's talking about a future sensor for its phones that will go even further than this, but it's not coming to the Xperia XZ2. Both phones also offer 960 frames per second super slow motion video capture, but where Samsung only has 720p footage capture, Sony has pushed it to 1080p, although with only three seconds of slo-mo compared to six seconds for Samsung. Battery life between the two phones should be pretty similar, as the Samsung has a 3000mAh battery, where Sony offers a 3180mAh option to keep you running all day. Both brands have techniques to eke the most efficiency possible out of the power packs, so until we test we can't tell which will be the strongest - but at least both offer wireless charging too. Samsung has historically offered the more 'complete' smartphone, combining specs with a refined experience. However, in this situation, Sony is also trying to create a more polished smartphones that combines power with a style to woo back consumers - it's just a shame that it's not significantly cheaper, as that would have been a real winner for the brand. Both phones will be available in April, according to what we're hearing, so we'll be able to pit them properly against one another soon.